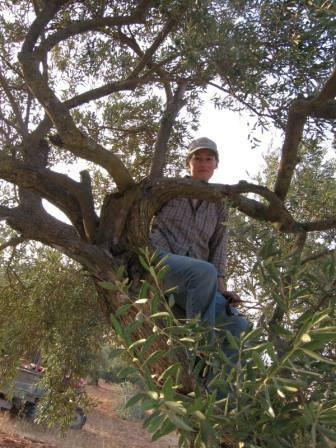 Here’s a piece from a letter I wrote back in the fall of 2007, during the olive harvest. 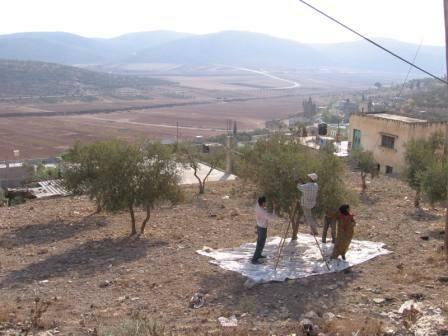 I was living in Ramallah and had been meaning to visit a friend of a friend up in Salem village near Nablus. It happened that some other foreigners were heading up for the harvest at the same time, so we went together in a service taxi, walked through the Huwara checkpoint south of Nablus, and caught another taxi to Salem. 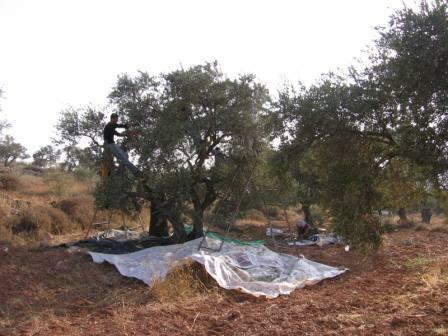 We ran into my friend’s friend on the main road of the village, a tall friendly guy in a cowboy hat named Nasir, and followed him and his sisters and aunts and cousins and brothers to the first little olive grove to get to work. He pointed out landmarks along the way, including the cemetery. 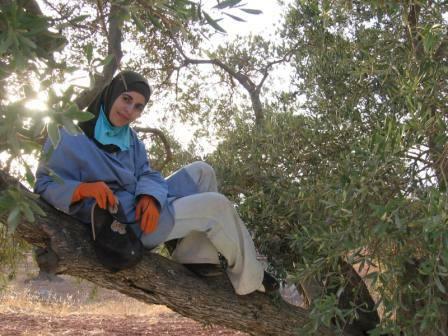 These sorts of stories from Palestinians are so common they’re almost banal. People speak of them relatively matter-of-factly in day-to-day conversation because there’s little choice. It’s either that or give yourself ulcers (which doesn’t help anything) or go completely insane. But his voice had a clear edge to it. He quickly changed the subject, and we finished the trees on the first piece of land in no time. 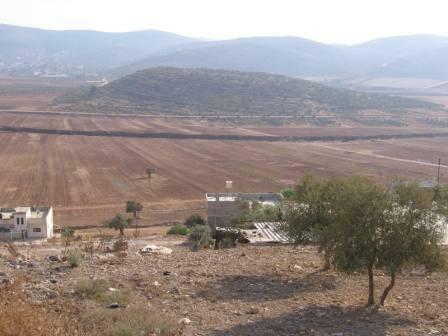 We moved to another area overlooking the broad valley below, and for the first time we saw the massive trench that the Israeli army had dug through Salem’s land. 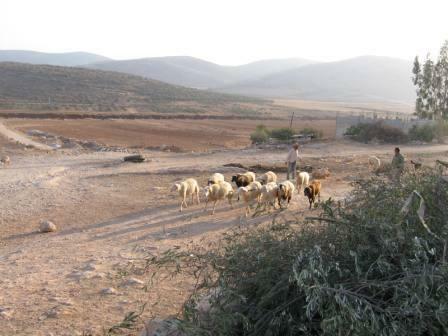 An Israeli-only settler road had already been built through Salem’s fields, which isolated the villagers from most of their land. They could still access their land, but not always, and certainly not freely. Settlers and soldiers could deny them access and/or harass and intimidate them whenever they got the notion in their heads to do so. As if this weren’t enough, one night the Israeli army dug a massive trench 100 yards out from the road, something like twelve feet deep and half a mile long, which isolated the villagers from this additional strip of productive land and isolated them even further from the rest. (To get tractors to their land, for example, they have to go far out of their way, and often they’re not allowed to pass at all.) Not to mention putting a huge, devastating scar on this idyllic landscape. It’s a jaw-droppingly maniacal thing to see. “I guess it’s to keep out all the Palestinian tanks and Armored Personnel Carriers,” I said, and everyone laughed. At the end of the long day of harvesting, we rested on the family’s gorgeous porch, which also looked out on the panorama of the valley (and the trench) with a view as big as a movie screen — the Palestinian version of HDTV. And we got a show that night, too. As some villagers who had ventured out past the trench were making their way home, an Israeli army jeep pulled up and three soldiers got out and ran toward them, ordering them to stop and shooting live bullets in the air. Of course the soldiers had no reasonable right to arrest the men for venturing onto their own land. But the soldiers could easily shoot, maim, or kill the villagers, then maybe file a report that said, “Three saboteurs were neutralized while trying to infiltrate a settlement area” or “Two Palestinians were killed while resisting arrest in a closed military zone,” which no one in the chain of command would have much incentive to question. Everyone knows this. So the villagers stopped and allowed themselves to be arrested and put in the jeeps and taken away. The women came back without their men, weary and worried but calm and composed. They’d been through this (and much worse) so many times. The brother of a British friend was visiting, and he had only been here a week — enough time to be shocked several times but not yet enough to hit his limit and start to go numb. The scene he witnessed clearly left him feeling ill and startled. 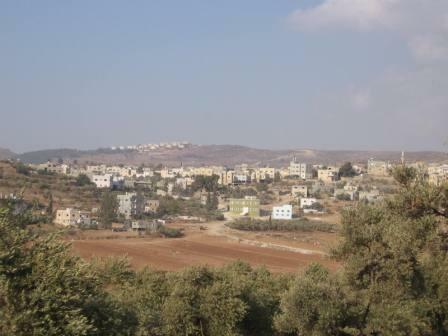 A few years ago I was talking to another British friend who lived in Nablus for a year. We were talking about how (relatively) chill Palestinians seemed vis-a-vis the excruciating things they kept going through, things that made us feel sometimes like we were going insane even though we didn’t have anything like the worst of it and could leave whenever we wanted. We were talking about the way Palestinians talked about things, and the way they welcomed foreigners and Israeli peace activists and really anyone who came in good faith, despite everything. It was almost unbelievable. The sun went down shortly after the live arrest scene on the big screen, and we weary harvesters were presented with a table full of mansaf, a dish with chicken and rice and bread and an addictively savory yogurt sauce. It was fabulously delicious, and we ate contentedly and gratefully. The other foreigners had commitments the next day and left shortly thereafter, but I stayed on for the next day’s jaunt out past the trench. The minaret of the town mosque announced that the villagers had been given permission by the Israeli authorities to access their own land, and in the morning Nasir’s sister woke me up at 8:00 (long after everyone else had already headed out) to take me and the family’s horse out to their land. I felt my skin crawl a little as we passed the trench. 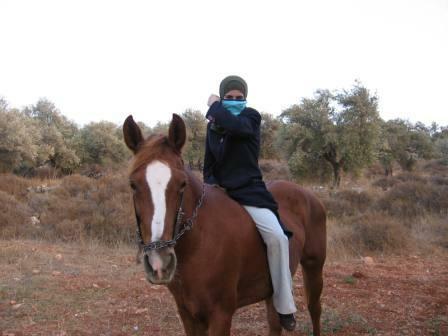 As I often do in these situations, I found some self-preserving instinct in myself hoping I didn’t look too Palestinian, so that if any random soldier or settler decided to take a potshot, hopefully he wouldn’t aim at me. It’s is a terrible thing to think for so many reasons, and it always makes me feel bad. 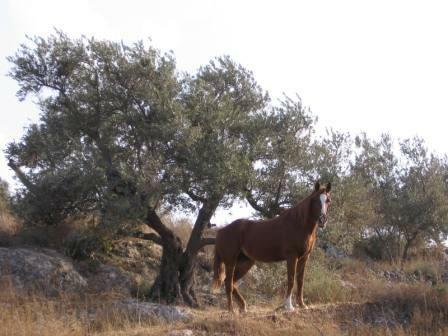 We crossed it and the settler road without incident, and Nasir’s sister and the horse and I headed up to the little island of a hill in the center of Salem’s valley, which was planted with many “Roman” olive trees, so-called because they were something like a thousand years old. Up here the air was fresher and the trees less dusty, and the view of the village across the valley was lovely. 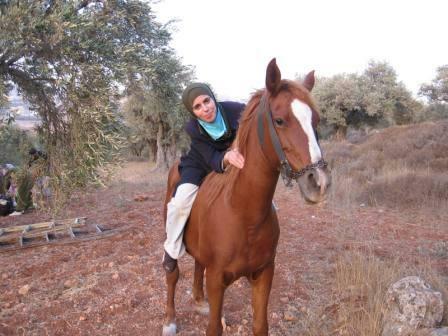 We took pictures of each other on the horse and in trees and harvested and chatted all day in a mix of Arabic and English. Mostly Arabic. It’s great practice for me to go to villages, where fewer people speak English. 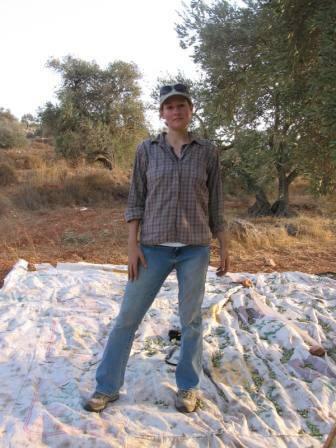 We shared another gorgeous dinner that evening, then I took off back to Ramallah, where I had a job interview the next morning. I got a minor scare on the way back, though. I was walking through Huwara checkpoint in the dark when a spotlight suddenly shone on me from one of the guard towers, nearly blinding me. I stopped, unsure of what to do. I reached toward my bag for my documents, but then the light started flashing at me, like a warning, so I put my hands up to wait for instructions. Finally I realized what had happened. I had been really tired and was thinking of something else, and I’d accidentally tried to walk through the checkpoint’s car lane. I quickly retreated and switched to the pedestrian lane. I was lucky. God knows how many Palestinians and Iraqis have been killed for making similar mistakes. ps: I dont usually invite strangers lol…just felt like i should after seeing your pics 🙂 I am also a writer. Thank you for the memories of Salem. And today the Jewish settlers are on a rampage to attack the villages in this beautiful village where people want to farm their land as their families have done there for generations. How very sad that these wonderful people aren’t free to live in peace on their land, which is all they want.